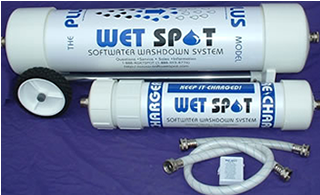 Wetspot is the original portable water softening system. Wetspot works basically the same way as a residential or commercial water softener, only it's been designed to be portable and is recharged manually, requiring no electrical hook up! Wetspot is also designed to last-they are constructed out of strong, low maintenance materials that can withstand even harsh marine environments. PVC, aluminum, brass hose fittings, rubber wheels, even our labels are manufactured of a specialized material! The resins that we use have been known to last for up to 30 years and more, before requiring replacement, so we offer a 12 year performance guarantee, with total confidence! Aside from recharging your unit with common rock salt, (approx. 12-15 minutes monthly), the only maintenance necessary to keep your WET SPOT PLUS looking new is to apply a little wax to the end caps, and replace the label every few years! We also recommend that you run our Conditioner through the unit every 6 months. Wetspot removes the hardness by using a resin. The resin carries sodium. When the hard water carrying the dissolved calcium and magnesium come in contact with the resin, the resin releases the sodium and grabs onto the calcium and magnesium ions that are making them hard. Thus, releasing a softer water. If there is dissolved manganese and/or iron in the water, Wetspot can also remove them. Using softwater will help ensure a lasting finish on Boats, RVs, autos, aircraft, etc. The harmful elements left in hard water can dramatically shorten the life of most finishes. Soft water is much more beneficial to hair and skin. Hard water may leave a film on skin and possibly cause skin irritations. Hard water may also leave behind minerals that can change your hair’s true color. Soft water leaves behind shiny, soft hair that is more manageable. Skin feels soft and smooth. Any appliances and plumbing that use water are also at risk for the abuses of hard water. The dishwasher, washing machine, coffee makers, and other on-board pumps, etc. will have deposits left behind if they are using hard water. When the deposits start building up, supply hoses and water outlets can slow down or become clogged. If soft water is used to run these appliances then there is less maintenance and less chance early replacement of equipment. Hard water requires more soap and synthetic detergents for laundry and washing, and contributes to scaling in boilers and industrial equipment. . Length 36" x Width 10" x Height 11.5"
Length 39" x Width 10" x Height 11.5"
This model is recommended for boats up to 100' and up. (Depending on water hardness and usage). For extra-large and/or built-in applications only. Before you buy one, please realize it is difficult for most people to single-handedly move on and off a docked vessel. Many clients have opted for two Plus Models, instead of one Super. Length 47" x Width 11" x Height 11.5"